Nero Move it is the easiest way to transfer, sync, share music, videos, and photos between 200+ devices. Effortlessly convert your music, videos, and photos from one file format to another across 200+ mobile devices automatically without having to figure out which format is needed. Nero Move it works seamlessly between devices such as mobile phones, digital cameras, MP3 players, PC's, PDA's, iPhones, iPods, PSP, and Blackberrys. ...... no matter what the format. 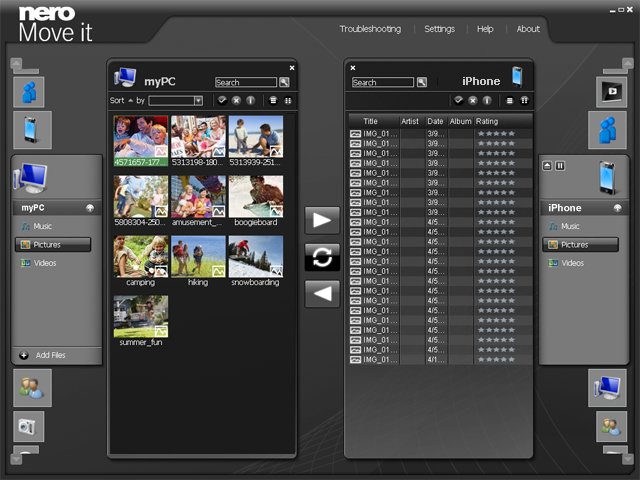 Collect your favorite music, videos, and photos from your digital camera, online communities, PC, and portable devices. Organize your content through personalized criteria such as artist, favorites, download dates, and file ratings. Convert your music, videos, and photos from one file format to another without having to figure out which format is needed for which device. Just plug in your portable devices or choose your output, and Nero Move it will automatically transcode the file to the desired format quickly and without hassle, even when transferring directly from one device to another. The integrated NVIDIA CUDA technology in Nero Move it lets users with compatible NVIDIA graphics cards convert their favorite videos faster and more efficiently. ZMover: Desktop layout manager that automatically positions and resizes windows. 'Remove Access Security 3.0' is the ultimate security tool. Free command-line FTP client. All 3 SSL modes and passive transfers supported. SpyRemover efficiently gets rid of spy/adware, and protects your privacy. Remove Toolbar Buddy is an essential utility to delete unwanted toolbars! It easily detects and removes all forms of spyware and adware with a few clicks. Detect and remove various malware on your computer. Qweas is providing links to Nero Move it 1.5.10.1 as a courtesy, and makes no representations regarding Nero Move it or any other applications or any information related thereto. Any questions, complaints or claims regarding this application Nero Move it 1.5.10.1 must be directed to the appropriate software vendor. You may click the publisher link of Nero Move it on the top of this page to get more details about the vendor.